I’m in Korea again. This time, it’s not primarily for cookbook research, but more for family reasons. It’s such a short trip, a few days in Seoul, then Guam (don’t ask), then Lunar New Year back in Seoul and a flight back to JFK the next day. Of course, I am taking advantage of the unique opportunities Seoul presents. Like eating pork belly on a tilted grill. I can’t even remember the name, it’s just a new place in the alleys near the Gangnam subway station, that my cousin and I went to last night. 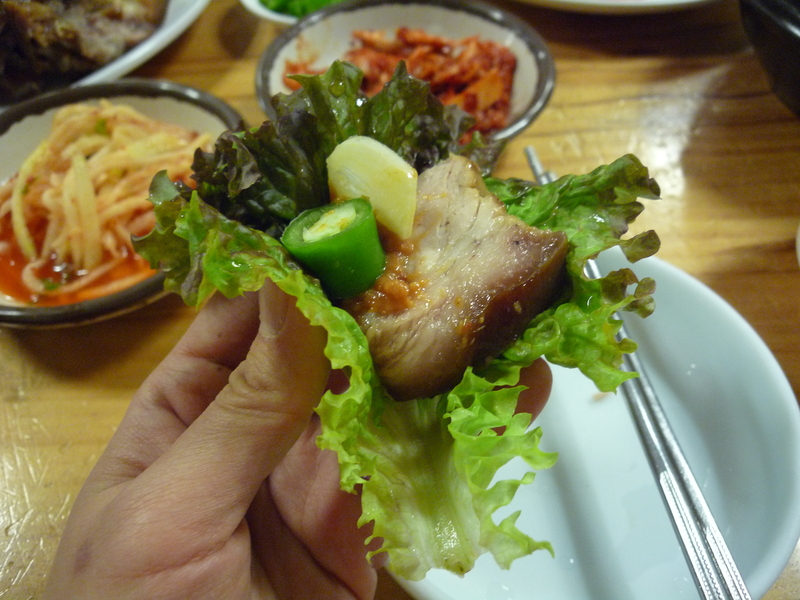 The samgyupssal or pork belly is served with your usual accompaniments—perilla leaves, red leaf lettuce, scallion salad—but also with thin slices of sticky rice cake that you use to wrap around your grilled bit of pork. 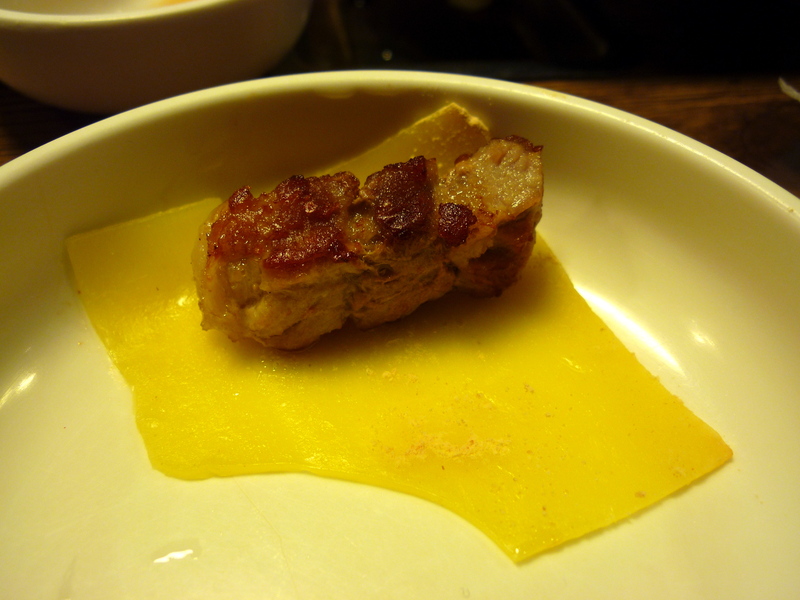 It wasn’t so good that I would urge you to rush there, but pork is pork, always enjoyable, and I really liked the chewy, tactile layer around the crisp belly. 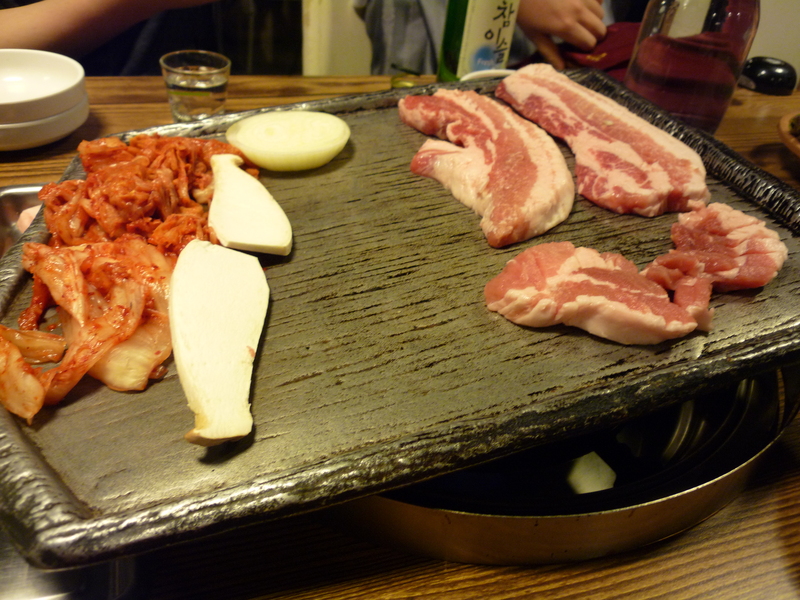 I also love that the grill is tilted, not only to drain the fat off the pork, but to direct the fat towards the kimchi and mushrooms. The edges of the kimchi got crispy, and the thick cabbage almost invisibly absorbed so much clear, golden fat, you could almost pretend you didn’t know why this kimchi had a particularly delicious flavor. You eat it the same way you eat so many Korean meats — wrapped up with lettuce, ssamjang or bean paste, and maybe a slice or two of raw garlic and hot pepper, though you might start with a swipe through salted shrimp sauce. 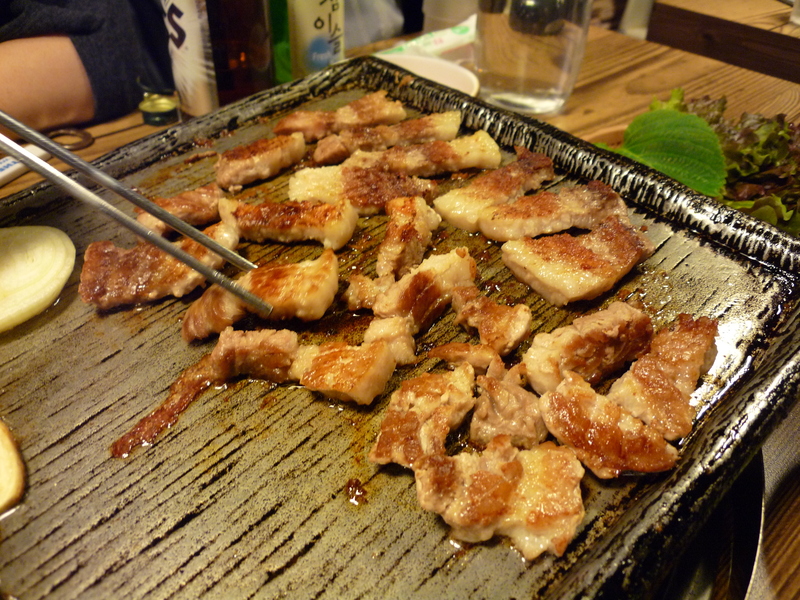 Koreans really love the briny flavors of seafood with the melting flavors of pork. I asked my mom how to make jokbal, and she had this look in her eyes like, “Oh God, she’s going to want to include it in her cookbook.” She quickly said, “You boil it, but you can’t do it at home!” Don’t worry, dear mother, I won’t be experimenting with pig’s feet at home, at least not for this cookbook. 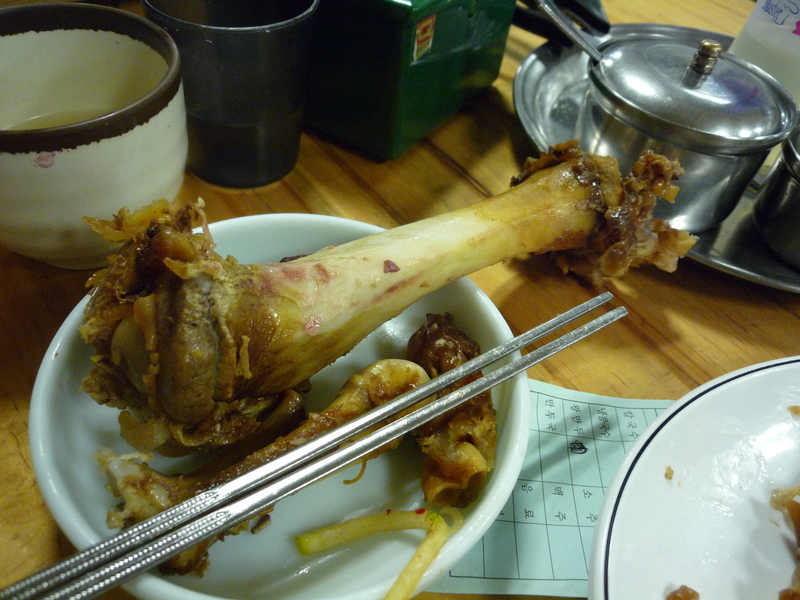 I am embarrassed to admit that I tried to gnaw on a trotter, but I couldn’t really follow through. Looking at the cleaned bones, I felt a little bit like a beast. A wolf, maybe. My cousin has invited me to have dinner with her again tonight — more pork. She says this place has neck meat to die for. My mother’s friend told me that if you dream about pigs, that means good luck. 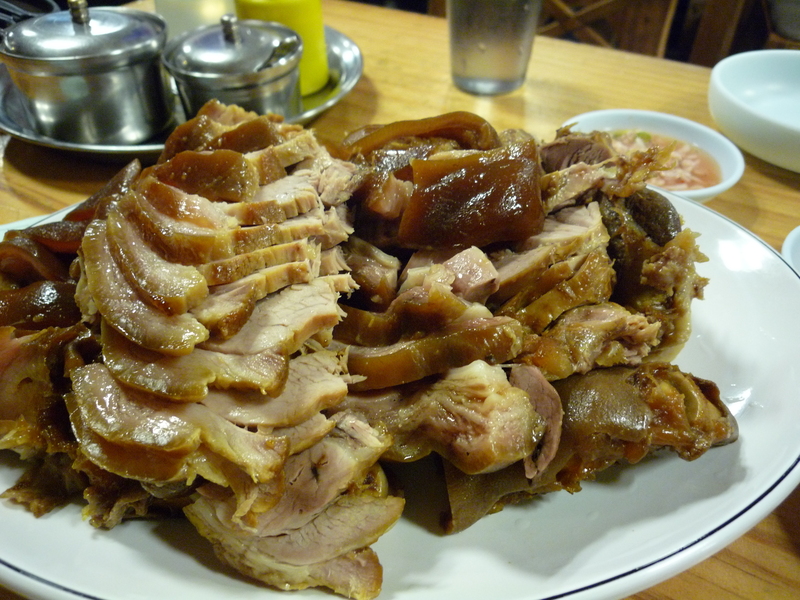 Having eaten so much pork, I would think pigs would be flying through my dreams by now. Sandong Son Kalguksu or (Sandong Handmade Knife-Cut Noodles), 3473-7972, Seocho-gu, Seocho-2-dong 1365.